Consumer prices were up 0.2% in March according to Statistics Canada’s monthly CPI report. Inflation was notably lower than expected for the month; market forecasts were for a 0.4% rise in the all-items index, following a monthly increase of 0.2% in February. February’s CPI data was also below expectations. With seasonal adjustments, prices fell 0.2% in March, adding to a 0.3% seasonally adjusted decline in February. 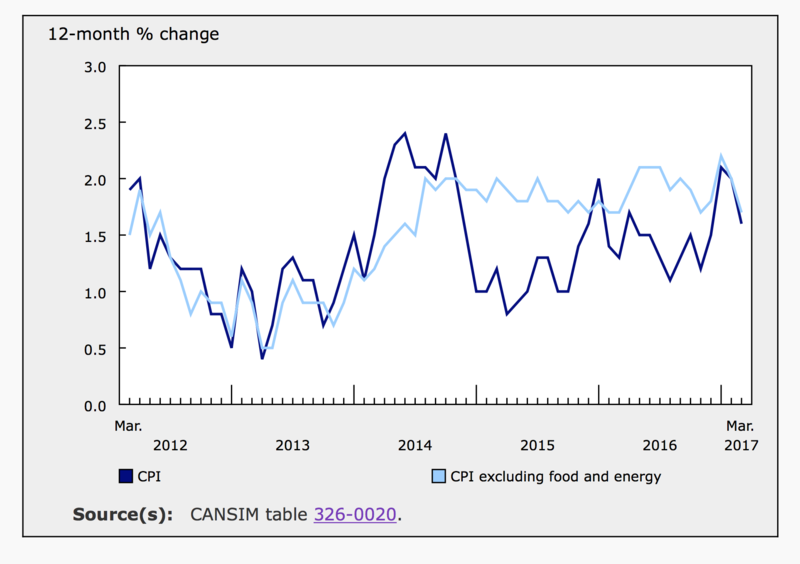 Recent monthly CPI data suggests that inflation is not a problem against which the Bank of Canada currently needs to take action. Today’s report will discourage the Bank from raising rates. Overall inflation was tempered in March by a 0.9% decline in the energy index. Excluding energy, prices were up 0.3%, slightly less than 0.4% the previous month. Core inflation (excluding food and energy) was also 0.3% in March and 0.4% in February. However, with seasonal adjustments, the core index fell 0.1% in March and was flat in February. Core monthly data is shown below. Higher prices for clothing and footwear and for education, recreation and reading (up 2.4% and 1.5% respectively before seasonal adjustments) were offset by cheaper gas prices and modest monthly growth in both food and shelter costs. The footwear index was up 4.1% in March. These spikes are related to seasonal patterns; on a seasonally adjusted basis, the index for clothing and footwear declined 0.7%. The seasonally adjusted index for recreation, education and reading was up a notable 0.6% in March, accelerating from 0.4% in February. Food prices were higher for the third consecutive month, by a marginal 0.1% in both February and March and 0.6% in January. With seasonal adjustments the trend is different (see chart above). Grocery store costs were up 0.1% in March, as an increase of 0.6% in the meat index was offset by a 2.0% drop in reported prices for fruit, fruit preparations and nuts. An extended period of falling food costs may have ended but prices at the grocery store remain volatile and mixed. The index for shelter also added 0.1% in March, despite a 0.6% decline in the price of water, fuel and electricity. The prices for rented and owned accommodation climbed 0.1% and 0.2% respectively. The index for health and personal care increased 0.2% in March, with both health and personal care prices slightly higher. The transportation index slipped 0.6% in March adding to February’s decline of 0.8%. This can be attributed to a monthly 1.1% decline in gas prices. The all-items index was 1.6% higher in March compared to a year earlier, after climbing 2% over the year ending in February. Growing energy prices drove overall inflation over the year; the energy index was up 8.5% year-over-year in March. The transportation index was 4.6% higher as gas prices grew 15.2% annually. Excluding energy, consumer prices were up a very modest 1.0%, down from 1.3% annually in February. The food index slid 1.9% over the year ending in March, following decline of 2.3% in February. At the grocery store prices were reportedly 3.6% lower. This was somwhat offset by higher prices for food purchased from restaurants; that index was up 2.4% annually in March. The clothing and footwear index was also weak over the year ending in March, down 0.9%, as clothing prices fell 1.6% compared to a year earlier. Shelter prices continued to grow at steady rate, up 2.2% for the year ending in March, matching the previous month’s annual rate. Within the shelter index, the price of rent was up just 0.6% annually. However, the index for owned accommodation added 2.6% year-over-year, reflecting higher home values. Also included in the shelter index, the cost of water fuel and electricity grew 2.8% in March. The index for health and personal care increased 1.7% annually in March, up from 1.5% in February. Within this index, healthcare costs were 1.8% higher and personal care costs were up 1.6%. The index for recreation, education and reading grew 3.6% year-over-year in March, up from 3.3% in February. 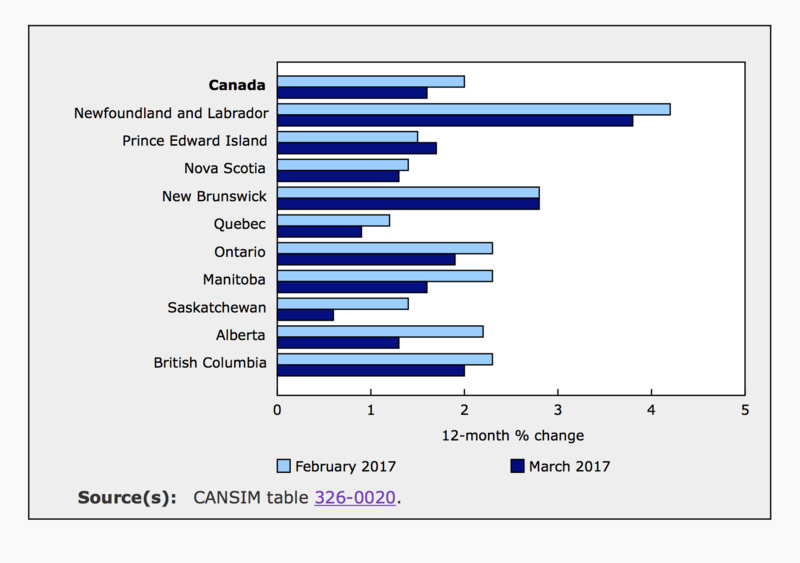 Annual inflation slowed in most provinces in March compared to February. 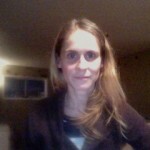 In New Brunswick inflation was unchanged in March and in Prince Edward Island annual inflation accelerated slightly. In PEI prices were up 1.7% in March, slightly higher than the national average because the index for travelers accommodation rose more and the index for clothing and footwear fell less there compared to other provinces. The Bank of Canada will make its next monetary policy announcement on May 24th. There is very little expectation that any changes will be made to the Bank’s policy rate. Growth in consumer prices is lacklustre, suggesting that the economy has plenty of room to grow before a rate hike is appropriate.